Today will be the last day for the 15 month special. Click here to purchase the extended subscription. This entry was posted in Uncategorized on December 31, 2010 by Gary. This entry was posted in Uncategorized on December 28, 2010 by Gary. It’s almost impossible to find anyone who is long term bearish on the stock market or economy at this time. In the recent Barrons poll every single analyst expected a rise in stock prices next year and continued economic expansion. I think they are all going to be wrong, horribly wrong. I believe next year the stock market will begin the third leg down in the secular bear market. And the global economy will tip over into the next recession that will be much worse than the last one. I’ve gone over the 3 year cycle in the dollar index many times. The dip down into the next 3 year cycle low this spring should drive the final leg up in golds massive C-wave. What I haven’t talked much about is what happens after the the dollar bottoms. I actually expect this three year cycle in the dollar to play out almost exactly like it did during the last three year cycle. When the dollar collapses this spring it will not only drive the price of gold to a final C-wave top, it will drive virtually all commodity prices through the roof, the most important being energy and to some extent food. It was the sudden massive spike in energy that drove the global economy over the edge into recession in late `07 and early `08. 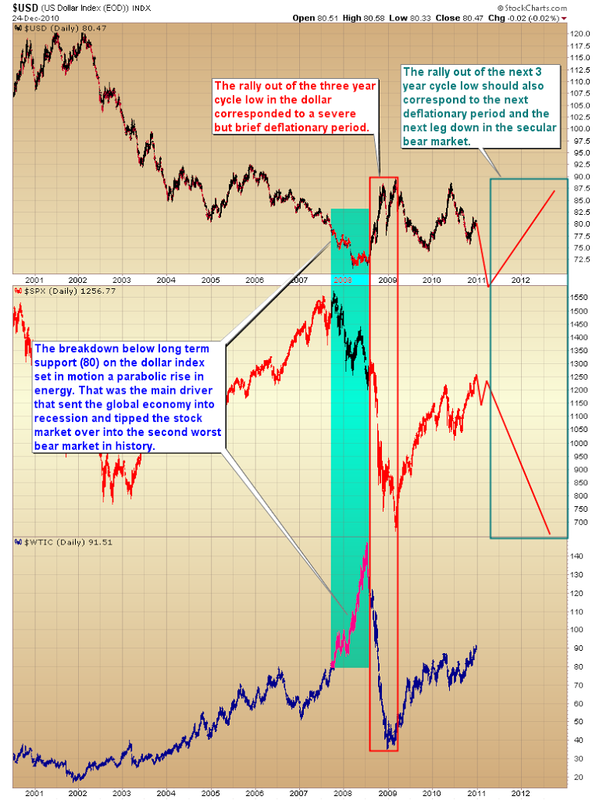 The implosion of the credit markets just exacerbated the problem. You can see on the following chart just as soon as Bernanke drove the dollar below long term historical support (80) oil took off on its parabolic move to $147. What followed was a collapse in economic activity and the beginning of the second leg down in the long term secular bear market for stocks. This was mirrored by the dollar rallying out of the 3 year cycle low. That rally was driven by the severe, but brief, deflationary pressures released as the global economy and then credit markets collapsed. We will see the same thing happen again. In his attempt to print prosperity and reflate asset prices Ben is going to spike inflation horribly as the dollar collapses down into the three year cycle low next spring. Just like in `08 that will tip the global economy back into recession and another deflationary period as the dollar rallies out of the three year cycle low. 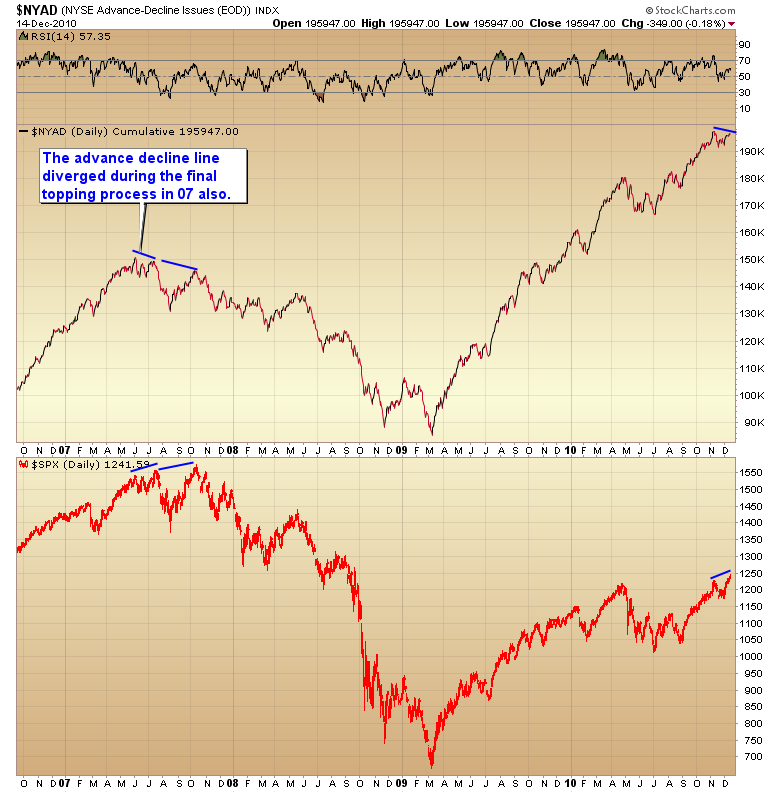 The stock market will begin the trip down into the next leg of the secular bear market that it’s been in since 2000. The global economy will roll over into the next recession. Which I expect to be much worse than the one we just suffered through mainly because it will begin with unemployment already at very high levels. Contrary to what economists and analyst are telling you, at the dollars three year cycle low next year it will be time to put our bear hats back on, prepare for hard times, and the next leg down in the stock market bear. I will leave the special Christmas subscription offer, (15 months for the price of 12), up for a few more days. If you want to take advantage of the discounted price click here. This entry was posted in Uncategorized on December 25, 2010 by Gary. I’ve temporarily unlocked this weekend’s update. I’m also going to run the special 15 month subscription until Christmas. Click here to read the weekend report. If you want to take advantage of the Christmas special (a perfect Christmas present for that hard to buy for investor) follow this link and click on the yearly subscription. 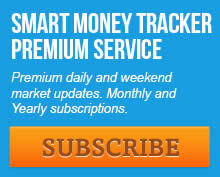 I will add three free months to the normal 12 month subscription. Sorry this offer is only for new subscribers and or current subscribers converting a monthly subscription. This entry was posted in Uncategorized on December 18, 2010 by Gary. 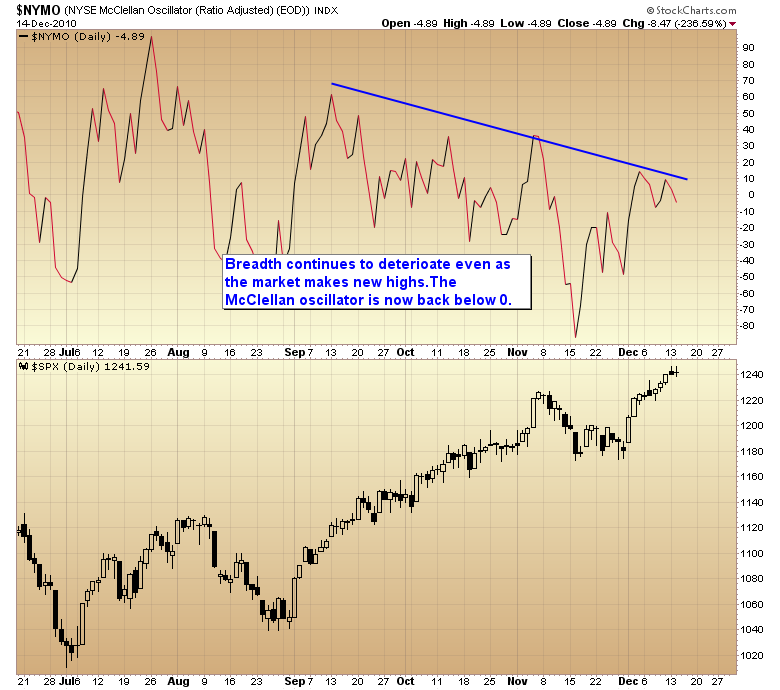 I’ve noted before that at intermediate turning points we will usually see breadth diverge from price. The McClellan oscillator is now showing a large negative divergence and has moved back below 0 despite the market making new highs. 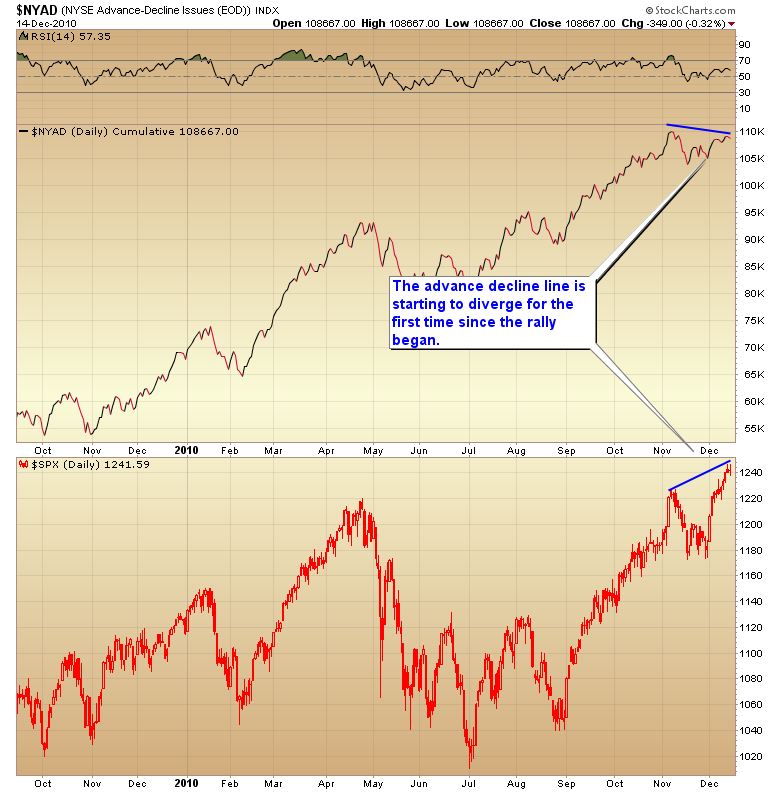 On a slightly more serious note we are also starting to see a divergence in the advance/decline line for the first time since the cyclical bull began. The last time this happened the market was entering the final topping process of the last bull market. I think that is probably the case here also as I believe we are already in a very large topping pattern. 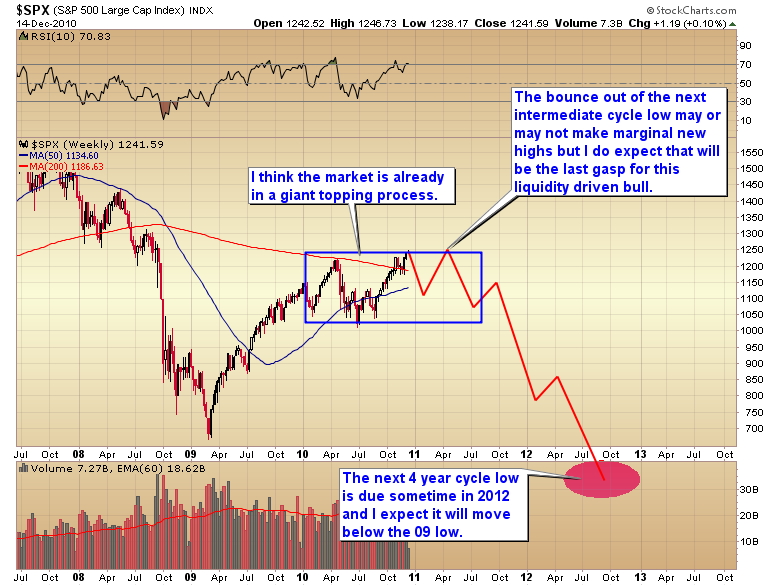 As you can see on the chart the next four year cycle low is due sometime in 2012. Bernanke has massively increased the monetary response in the attempt to halt the secular bear, and we know how the last attempt to control the market turned out (we got the second worst recession since the Great Depression and the second worst bear market in history). I fully expect the next leg down in the secular bear to be even worse that the last one. Not only in the stock market, but also in the economy. Greenspan already proved that you can’t meddle in the markets without eventually causing bad things to happen. Unfortunately Bernanke doesn’t seem capable of learning that lesson and has now made the same mistake again only on a much larger scale. I’m confident it will only lead to a much larger collapse in the end. We will almost certainly dip below the `09 lows at the next 4 year cycle low, probably in nominal terms and certainly in inflation adjusted terms. Once the impending intermediate degree correction runs it’s course we will get what I believe will be the last rally in this cyclical bull market. That rally may or may not make marginal new highs before rolling over into the next leg down in the ongoing secular bear market. I expect by this time Bernanke’s insane monetary policy will have spiked inflation high enough to collapse the economy again and the global stock markets will begin the trip down into another devastating bear market. In 2012 they won’t be calling it a Great Recession they will be labeling it by it’s true name; The next Great Depression! This entry was posted in Uncategorized on December 15, 2010 by Gary. 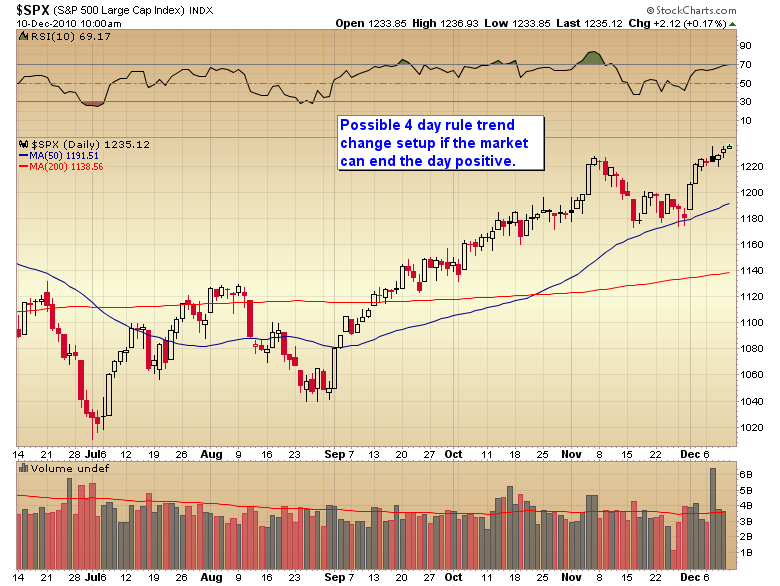 If the market can end the day with a gain we will get a 4 day rule possible trend change signal. The four day rule says; After a long intermediate rally look for the first down day to signal an intermediate trend change after the market rallies 4 or more days in a row. The four day rule is a sign of extreme sentiment. I would caution that it only works after a long intermediate rally lasting multiple months. We have those conditions right now. We have also reached extreme bullish sentiment levels. The kind of levels where we are in jeopardy of running out of buyers. Add to that the fact that the intermediate cycle is now going on it’s 23rd week and we got a large selling on strength day a couple of weeks ago (a sign institutional smart money is exiting in front of a large correction.) and we can probably expect any further gains to be given back and then some when the market moves down into the intermediate degree correction. Now is not the time to press the long side in either stocks or gold. That doesn’t mean one should short. Shorting bull markets is a tough trade. You have to time the exit perfectly and survive the violent fakeout rallies to make money. Not to mention you will invariably miss time the entry several times. All in all you will probably be better off just going on vacation for the next 5-6 weeks. This entry was posted in Uncategorized on December 10, 2010 by Gary. 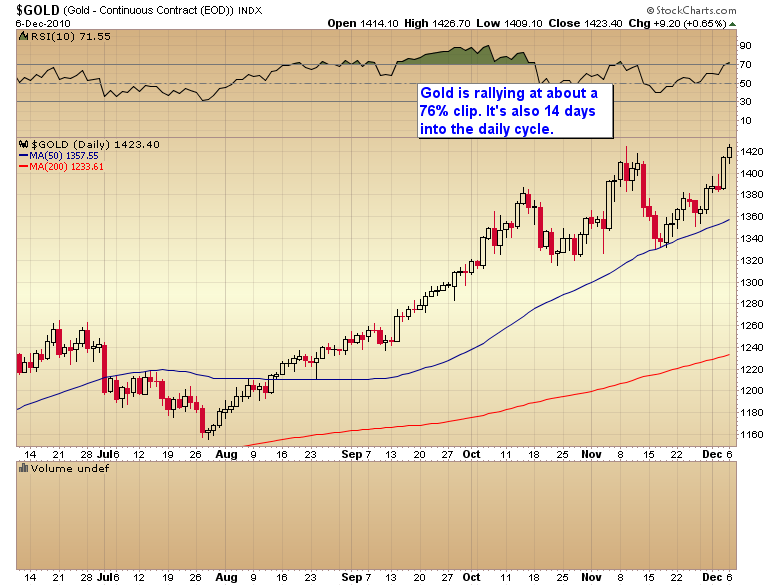 If gold closes positive today it will be moving higher at a 76% clip. Today will mark the 14th day of the current daily cycle. We will soon enter the timing band for the next cycle low. The dollar is now deep into the timing band for a cycle low and could bottom sometime this week. All signs that an intermediate top is approaching. Trust me we will get a profit taking event. They come like clockwork about every 20-25 weeks. I went over in the weekend report what to look for to spot a potential top. Stay on your toes here folks! This entry was posted in Uncategorized on December 7, 2010 by Gary. This entry was posted in Uncategorized on December 6, 2010 by Gary. I really don’t have anything I want to post at the moment as I’m using everything for the premuim newsletter so I’ll just use this as a comment cleaner. 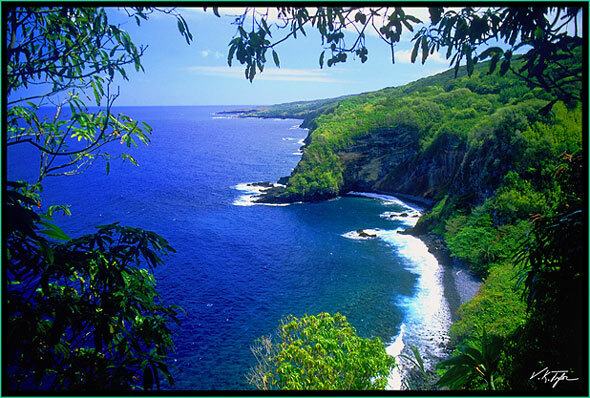 I’m going to include a picture of where I will be Saturday. This entry was posted in Uncategorized on December 1, 2010 by Gary.